The photographs below, taken between October 1990 and June 2017, tell the story of the modern Francis Field. 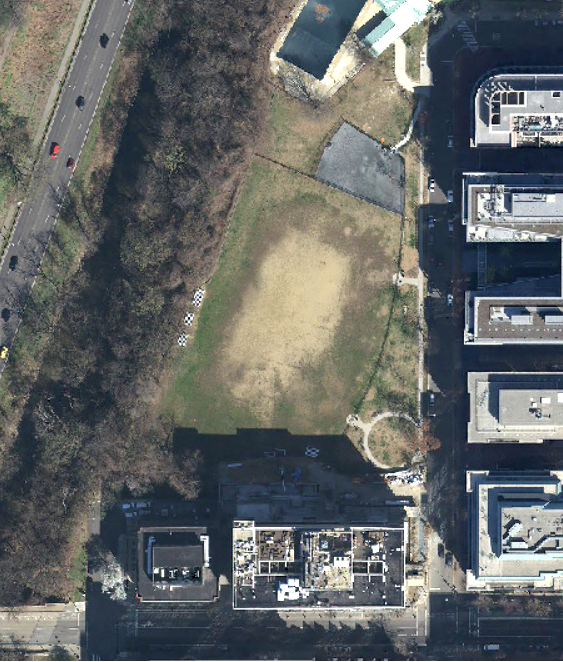 As described in the history article on this website, Francis Field got its name in the 1930s, when the eastern part of it was acquired as playground space for "colored" schoolchildren in the District of Columbia's segregated recreation system. For most of its history the field has been overused and under-maintained; a neglected and unattractive public space. Until the late 1970s, the West End was zoned for light industry, and the housing was largely sub-standard. The neighborhood began changing slowly after a 1972 urban renewal project, (see history article) but the field remained run-down. Date of photo: October 1990. Mayor: Marion S. Barry, Jr. In an agreement reached between Mayor Barry and GWU President Stephen J. Trachtenberg, the field became, as a GWU press release called it, "the new home for the Colonial soccer and baseball teams." 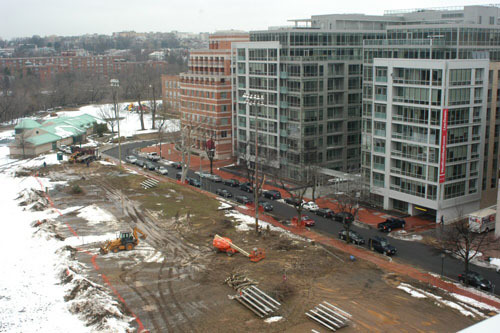 The GWU photo at left shows the southern end of the field, after it had been resurfaced with sod. Three of the five new stadium lights can be seen. The improved field was "dedicated" on October 17, 1990, at the halftime of GWU's men's soccer game with Temple University. Date of photo: September 1999. GWU's deal with Mayor Barry quickly ran into legal and political problems. As the Washington Post reported early on, DC law required public access to public fields, and this changed the exclusive arrangement. "The university," the Post reported in November, "will use the field on a permit basis, in competition with community requests. "2 These included local softball and soccer leagues, for whom the lighted field seemed irresistible. 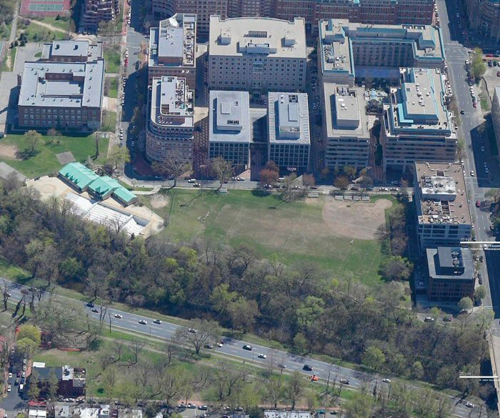 Three years after investing $500,000 in the field and its irrigation system, GWU moved its baseball team across the Potomac to Barcroft Field in Arlington.3 Mayor Barry's Recreation Department did not maintain the field or the irrigation system the way that GWU had, and it soon failed. Barry did not run for re-election in 1998. Anthony Williams succeeded him, and much was expected of Williams, whose background was in financial administration. He renamed the Recreation Department as the Department of Parks and Recreation (DPR) but little changed. 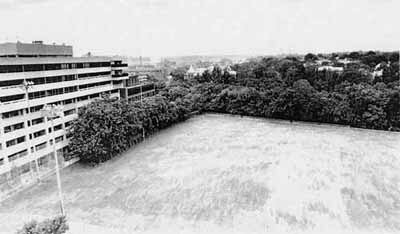 Francis Field's condition, which deteriorated more and more every year, was mostly bare dirt, as shown in the photo at left. Newman, the DPR director, came under additional criticism from the media—another Post editorial, for example, was titled "Wrecking DC Recreation. "5 Newman resigned on October 23, 2000. Francis Field remained in horrible condition. Date of photo: Fall 2003. DPR Director: Neil O. Albert. This aerial photo shows the field after the only attempt to plant grass or resurface the field between 1990 and 2017. In April 2002, under a new and reform-minded DPR director, Neil Albert, the entire field was replanted, the infield was skimmed, and Francis Field was closed for one year to allow the grass to grow. However, the central area was not sufficiently decompacted, and the field was not effectively closed. Many groups continued to play pick-up games on the young grass while it was growing. The newly formed "Francis Field Committee" of the Westgate Condominium at 2501 M Street also convinced the new DPR director to take down two of the five stadium lights that had been erected in 1990 in front of residential windows at the south of the field. This was a welcome development, but the other three lights continued to be a nuisance, and a light pollutant into Rock Creek Park— where it was, and still is, against park regulations to hunt earthworms with a flashlight. Date of photo: May 29, 2007. Mayor Williams served two terms, and announced that he would not run for a third. Elected was former City Councilmember Adrian Fenty, who, as mayor, would have four DPR directors during his four-year term. Wanda Durden, the first, served in an acting or interim role for seven months. 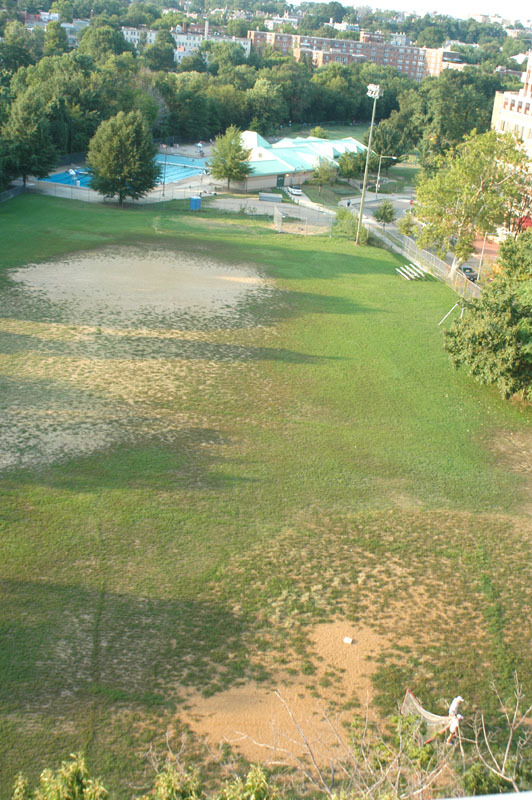 As shown in the photograph at left, the central playing field had again become bare dirt, four years after being reopened to let the grass planted in 2002 grow for a year. Baseball teams did not wear out the outfield. 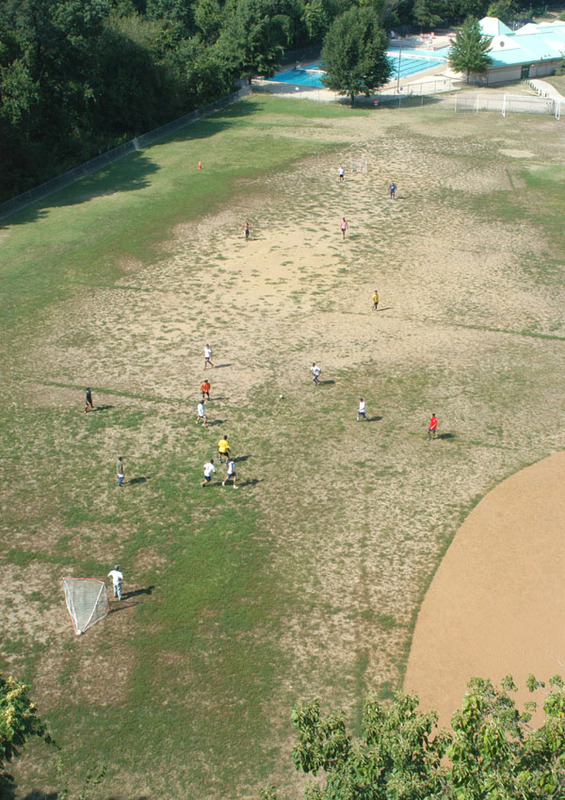 Over-permitting to soccer leagues, and the many un-permitted, pick-up soccer games that took place combined with a lack of maintenance to return much of the field to a bare-dirt center. Shown also in this photo is the unofficial "life-guard parking lot," that DPR employees felt entitled to make use of. Date of photo: August 18, 2007. DPR Director: Clark E. Ray. Clark Ray, the second of Mayor Fenty's DPR heads, was named acting director of DPR on August 3, 2007. 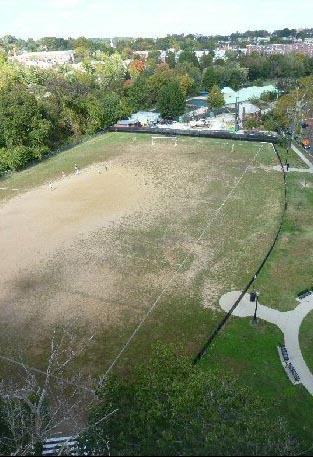 The photograph at left, taken during one of many unpermitted soccer games, shows the field condition one year after he took office. In May, Mayor Fenty announced that "all athletic fields will undergo major repairs ... such as installing FieldTurf, with appropriate drainage and irrigation systems installed under the artificial turf."8. This provided one explanation for why the field was so deteriorated and dangerous: overuse as a soccer venue. Lack of maintenance for the amount of use was another. Date of photo: April 3, 2009. 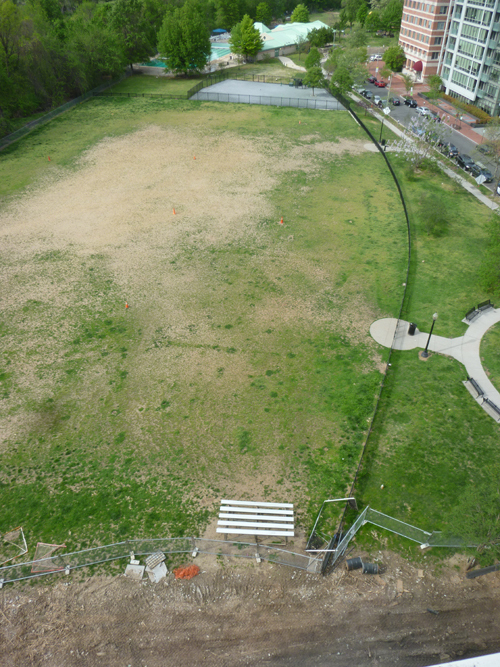 The pair of photographs above show the bare-dirt center field during rain, and the compacted condition that makes it almost impermeable, and causes runoff into both Rock Creek on the west and 25th Street on the east. The skinned baseball infield also contributed to this runoff. Neither of Mayor Fenty's first two DPR heads made any improvement to Francis Field. The mayor's desire to install artificial turf on fields kept DPR from funding any other type of improvement to the field's surface, although the 2007-2009 zoning case made improvements to the outside areas of the field. See also the article on the master landscape plan for Francis field on this website. Date of photo: August 14, 2009. As Mayor Fenty's third head of DPR, Ximena Hartsock only served in an interim or acting capacity. No improvement to the playing field was made during her term. As shown in the photograph at left, weather conditions, the amount of rain, and the amount of use the field to which the field was subjected were the factors that largely determined how it looked. Bare dirt never disappeared for long, although the weeds that managed to grow became greener in wet weather. Date of photo: February 23, 2010. Jesús Aguirre was appointed on December 2, 2009, as Mayor Fenty's fourth and final head of DPR. The improvements in Francis Field's architectural fabric, ordered by Zoning Commission in 2007, were implemented beginning in February 2010. Aguirre had played no role in their approval, or in the development of the architectural plan for the field. As shown in the photo at left, the zoning case improvements were made only to the east side of the field, along 25th Street. 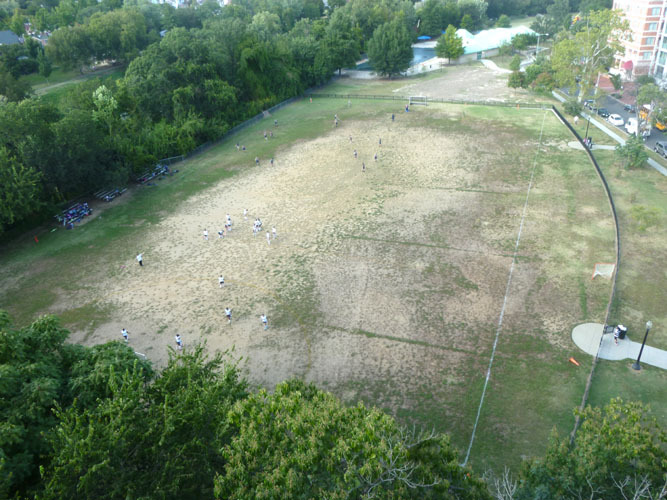 The central playing field was not affected or improved. On the left of the photo, snow can be seen. The work to install an ornamental fence, benches, trash receptacles, a drinking fountain, and safety lights never extended past the snow line. See both zoning case and master plan articles on this website. Date of photo: October 16, 2012. Mayor Fenty was defeated for re-election in 2010 by Vincent Gray, the District Councilmember for Ward 7, and the Council Chair at the time of his election. Mayor Gray retained Jesús Aguirre as DPR director. This photo shows the zoning improvements in place: particularly the low, black fence, the drinking fountain (at the north entrance gate) and the circular sidewalk and benches at the south entrance gate. It also shows that the zoning case improvements did nothing to improve the central playing field. The bare-dirt field was not improved during the four years of the Fenty administration with its four different DPR directors. Nor was it improved during the four years of the Gray administration. In the fall of 2012, DPR's permitting of a for-profit social sports league to use the field for nine weeks of soccer, with six teams playing three simultaneous games, left the field in its worst shape since the late 1990s. Visible at the north of the photo, between the playing field and the swimming pool, is the construction that went on for more than a year to rehabilitate the Cross Town Tunnel, a water main seven feet in diameter that brings water into the city. The only access to the tunnel, which is 120 feet underground, is a shaft at the north end of Francis Field. Date of photo: September 19, 2013. The School Without Walls, a DC public high school located in the Foggy Bottom neighborhood introduced field hockey as a sport in 2011, and lacrosse in 2013. Those teams began permitting Francis Field for after-school practices. Shown in the photograph at left is the girls' field hockey team attempting to play an exhibition match on Francis Field against a suburban school team. The field was mostly bare dirt, and definitely sub-standard. The Walls teams play league games elsewhere. This photograph shows the Cross Town Tunnel construction completed, with the site cleared. Francis Field however, looks almost the same as it did in the 2012 photo further above. Date of photo: October 2015. DPR Director: Keith A. Anderson. Mayor Gray failed in his bid for re-election in 2014, and was defeated by Muriel Bowser, the Ward 4 Councilmember. No improvement to the field surface was made during Gray's four-year administration under either of his two DPR directors, Jesús Aguirre or Sharia Shanklin. 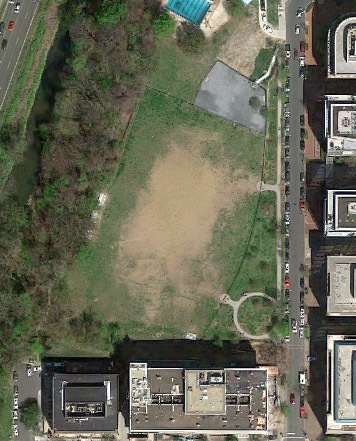 The major change to Francis Field in the first year of Mayor Bowser's term was the construction of an official dog park, which had been approved during the Fenty administration but never built. It is shown between the playing field and the swimming pool, at the former site of the 2011-2013 Cross Town Tunnel project. Construction of Francis Dog Park was begun in September 2015. It opened on November 27. No improvements were made to the playing field surface that year. Date of photo: April 25, 2016. At the bottom of this photograph is the construction easement granted to the developer of the 2501 M Street building for its conversion from mixed-use office and residential, to entirely residential. That part of the field will need to be restored when construction ends, scheduled now for September 2018. As the photo also shows, no improvement was made to the playing field. During 2016, Friends of Francis Field attempted to renewed a partnership agreement with DPR to allow it to improve the field with private funds. However The agreement expired in June 2016, and was not renewed by DPR until March 2017. 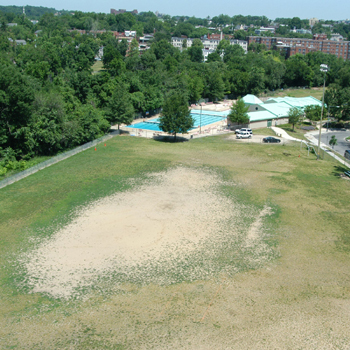 Thus, no improvement to the playing field surface was made during the first two years of the Bowser administration, with either public or private funds. The field condition continued to deteriorate. Date of photo: Winter 2017. This photo also shows that construction work was progressing on the 2501 M building at the south end of the field. On March 1, DPR and Friends of Francis Field reached an agreement to allow improvements to the field with private funds. The three-part agreement permitted the planting of about 40 trees in May, and the closing of the field in June to allow for grass to be planted. A study of irrigation problems and solutions was also agreed upon. However, the actual installation of irrigation was not included. DPR's permitting office set the date for closing the field as June 19, and its reopening was set nine months later, on March 17, 2018. Thus, much of the work on the playing surface would have to be done during the hot summer months if the grass would have a chance to mature before the field was reopened. This would certainly be a challenge. The Project Going Forward: A New Era of Care? Each of these three elements of the agreement is discussed on this website in a separate article. See Plant Trees, which was accomplished successfully on May 13, 2017; Plant Grass, which began in late June with a concentration on the bare dirt sections; and Irrigation, which remains under study with a temporary, experimental system. 01. George Washington University, "Francis Field is New Home for Colonials Soccer and Baseball Teams," (press release), October 10, 1990. 02. Jessica Porter, "GWU Repairs City-Owned Field in Unique Agreement," Washington Post, November 8, 1990. 03. Hayden Hill, "A New Home for Colonials Baseball," GW Impact: Report on Philanthropy, George Washington University (Winter 2012) p. 11. 04. "Pitiful Parks," editorial, Washington Post, July 1, 2000, p. A24. 05. "Wrecking D.C. Recreation," editorial, Washington Post, October 20, 2000, p. A32. 06. Charlotte LeGates, "Sports Return to Reopened Francis Field," The West End Guide, April 2003, p. 8. 07. DC Stoddert Soccer, "Minutes of the Meeting of the Board of Directors," January 9, 2008, Item IV, B, p. 3. 08. "Memorandum of Agreement Between District of Columbia Department of Parks and Recreation and DC Stoddert Soccer," February 27, 2009, pp. 2-3; "Attachment B," p. 7. 09. 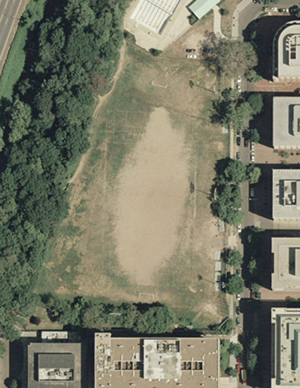 Jessica Gould, "Turf Battle Rises Up over Francis Field," Foggy Bottom Current, June 25, 2008, p. 1. 11. Mike Debonis, "New Parks Director: Ximena Hartsock," Washington City Paper, April 20, 2009..
12. Tim Craig and Nikita Stewart, "Council Votes Against Fenty's Pick to Lead Parks and Rec, Washington Post,, October 7, 2009. 13. Vincent M. Gray, "Appointment - Interim Director, Department of Parks and Recreation," Mayor's Order 2013-168, September 16, 2013. 14. Paul Schwartzman and Chris L. Jenkins, "How D.C. Mayor Fenty Lost the Black Vote—and His Job," Washington Post, September 11, 2010. 15. Michael Neibauer, "Mayor Vincent Gray Moving Millions," Washington Business Journal, August 10, 2011.